Get the straight smile you've always wanted with Invisalign® clear aligners at Go Dental in Calgary. Misaligned teeth are often a cause of concern for people of all ages and the days of metal braces to straighten your teeth are over. The dentists at Calgary’s Go Dental provide patients with Invisalign® treatment as an alternative to traditional braces, which can help gradually straighten teeth with the use of virtually invisible and removable aligners. Invisalign® is a set of virtually invisible aligners which are made of a thermoplastic material that look similar to teeth-whitening trays. A series of Invisalign® aligners are custom-made for you, to move your teeth in correct positioning. With Invisalign®, your lifestyle is uninterrupted, meaning you can still enjoy the activities and foods you love. All with no unexpected trips to the doctor due to broken wires or brackets. In order to create your Invisalign treatment plan, your dentist will begin by taking an impression of your teeth. Once the impression is complete, the data is entered into specialized computer software that projects the gradual movements your teeth will make over the course of the plan. This software will show you how your teeth will shift, and what the end result will look like before you even begin. Next, you will receive a set of customized, clear aligner trays, to be worn in two-week increments. As you replace each aligner with the next in the series, your teeth gradually shift until they have straightened to the final position prescribed. Throughout the process, you will be required to visit our dental clinic occasionally to ensure your treatment is on track. Duration of treatment will vary depending on the severity. Generally speaking, most treatments take approximately one year, and consist of about 20 aligners. Your candidacy for this treatment can only be determined through a comprehensive dental exam, so book an appointment with one of Go Dental’s general dentists today to get started. We find that Invisalign® aligners are most effective when worn 20 to 22 hours per day and removed only for eating, brushing and flossing. The length of treatment depends on your unique case and can only be determined by your dentist. On average however, cases take about 12 months for adults. The length of time necessary for a teen patient may vary and can be determined by your dentist. Your dentist will schedule regular appointments, usually about once every four to six weeks. The goal of these visits is to ensure that your treatment is progressing as planned. Schedule a consultation with us to find out if Invisalign® is right for you! 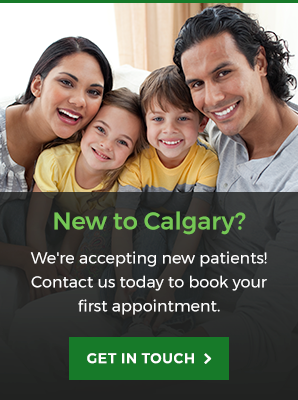 As a dentist, it's my goal is to treat each of my patients with the utmost of care, and to serve the Calgary community to the best of my ability.